Get Free Resume Writing Tips & More in Your IN-Box Monthly! 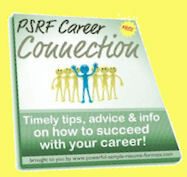 PSRF Career Connection is your free resume writing tips e-newsletter. Consider it your career zone of choice! If you're serious about getting a job – and not just any job, but a great job – then you'll want to learn all you can about every step of the process... and I'm here to help! In fact, that's exactly why I wrote this site... to help job-seekers like you find the jobs they deserve. But the site is fairly static... and the job market is changing all the time. So, while reading through an "encyclopedia" of info like that you'll find on this site is certainly useful, it's also nice to get more timely and up-to-the-minute tips too. And that's why I decided to start my newsletter a few years ago. eZine... newsletter... e-newsletter... what's the difference? Well, there isn't any, as far as I'm concerned. I use the terms interchangeably. Here's the bottom line. The newsletter I'm talking about on this page is sent out through email, which makes it an eZine (short for e-magazine) or e-Newsletter. See? Anyway... This site... Your Career Connection @Powerful-Sample-Resume-Formats.com... has been in existence since early 2004. Originally, I was just offering some weekly tips and maybe an article, but over time, I kept adding to my mailings, so that now they include an email course, special report and of course a full-fledged monthly newsletter. For the past few years, I've been calling the newsletter "Resume Power Tips", but the fact is both the site and the newsletter have grown to incorporate more than just information about resumes. I also educate people on cover letters, job interviews, career planning and career change and even self-employment. If you're like me, you probably don't read half the newsletters you're already subscribed to, at least not the free ones. Let me confess something... I delete most of the newsletters I get in email... even though I signed up for them of my own free will! First off, this newsletter will always be filled to the brim with free resume writing tips, how-to tips on cover letters, information and advice about job interviews, and real strategies you can use right away to skyrocket your job-hunting success. And best of all... it's 100% FREE! Resume Power Tips is a totally free resume newsletter that will always be full of practical tips & information you can use right away to help with your job hunt. I'll keep it short and sweet, and I won't include a lot of fluff or useless advertising. You'll get it monthly, but not more often. I'm not in the business of promoting spam, so I don't ever sell, share, or trade email addresses or any other personal information from my subscribers. I guarantee that your info stays private, just the way you want it. You can unsubscribe with one click, any time you want to. Check out a back issues here for a sample of what you'll get. But There Has to Be a Catch... Right? Ask you for feedback, input and your opinions. 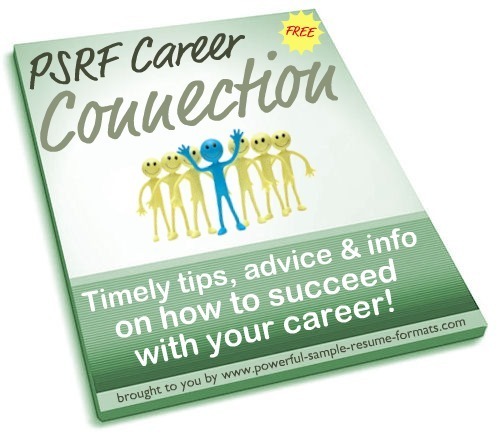 I strive for constant improvement with the PSRF Career Connection eZine, and I'd like to focus that on what YOU tell me. I hope you'll be willing to your ideas and opinions honestly with me. In return, I promise to listen and implement them, whenever feasible. Tell you about products or services I think you might benefit from or be interested in. That doesn't mean the Career Connection will be packed full of advertisements. My goal is to create a lasting relationship with my readers. I would never do anything that might jeopardize that relationship. I don't want my newsletter to be one of those worthless kinds that's more sales pitch than substance! But once in a while (certainly not in every issue), I might recommend a book or web site or service that is relevant to what's being discussed. And I hope that you'll value my opinion enough to maybe check out some of my recommendations now and then. And that's really all there is to it... no scams, no gimmicks, no bait and switch. 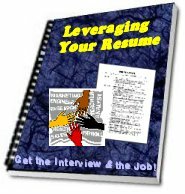 Bonus #1: "Leveraging Your Resume to Get the Interview AND the Job!" Bonus #2: "Top 10 Secrets of the World's Greatest Cover Letter!" Also, each of my subscribers get the world's greatest cover letter tips from my friend, Jimmy Sweeney, one of the Web's foremost authorities on crafting killer cover letters that WILL get you the job interviews you're seeking. It's a free report, yours for the taking! So, can you think of any good reasons not to fill out the short form below and start getting this wonderful resume newsletter –completely FREE—before another minute goes by? There's a whole world of knowledge out there, and it's yours for the taking! To protect your security, I require that you confirm your subscription to the PSRF Career Connection eZine. That means you not only have to fill out the form below... you must ALSO click the confirmation link in an email that should arrive in your email box shortly thereafter. If you don't click the link, you won't get the newsletter or any of the free gifts I described above! So, please... watch for the email and click the confirmation link, OK? I really want you to get these tips. Just fill out this short form and I'll get you started! Thanks for visiting and signing up for our free resume writing tips newsletter and career connection resource! I'm really looking forward to staying in touch and providing you with great information and ideas about resumes, cover letters, interviews and more in my resume newsletter.